What can Fido, or Filly or Fred expect when they hit Torquay or Torbay. What new smells, doggy encounters and new experiences can they expect? 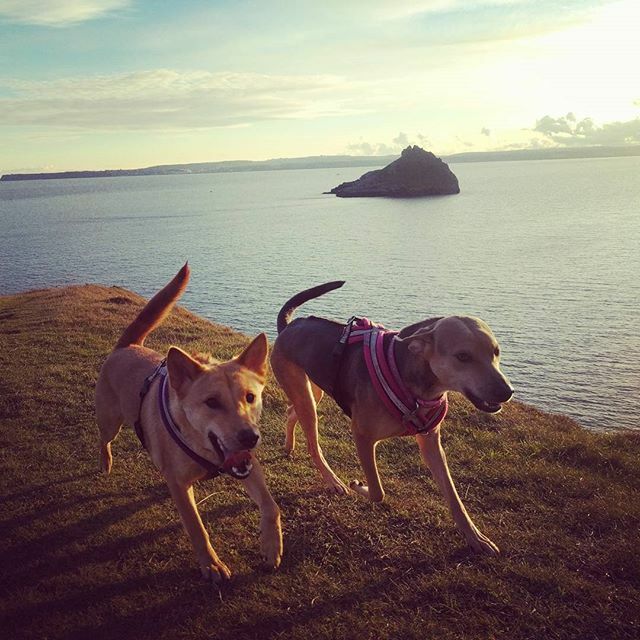 Below we discuss some of the best dog walks in Torquay, including some great dog friendly beaches. 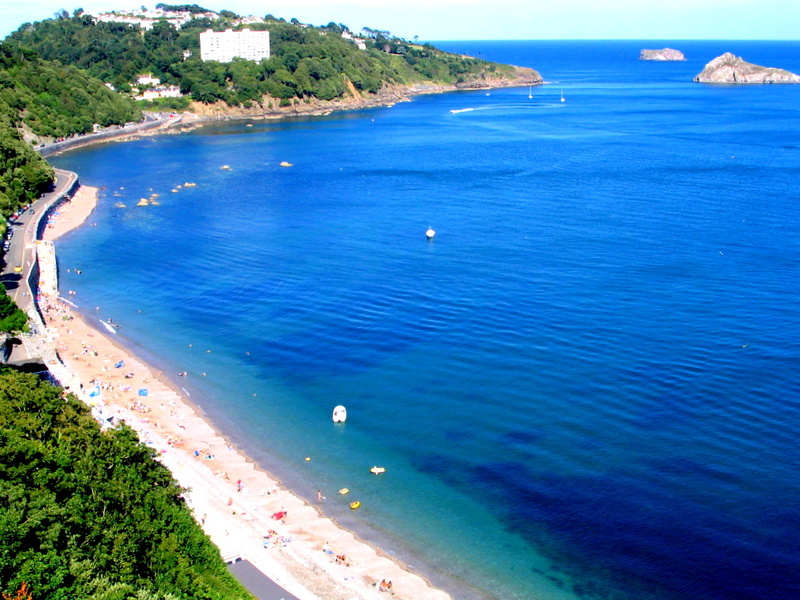 Torquay is part of Torbay and in South West Devon. Torquay is the most northerly of the three towns but all interlinked. The other two towns heading south are Paignton, then Brixham. These 5 places for dog walking and canine fun are mostly coastal based but cover beach, woods, parks and peninsulas. 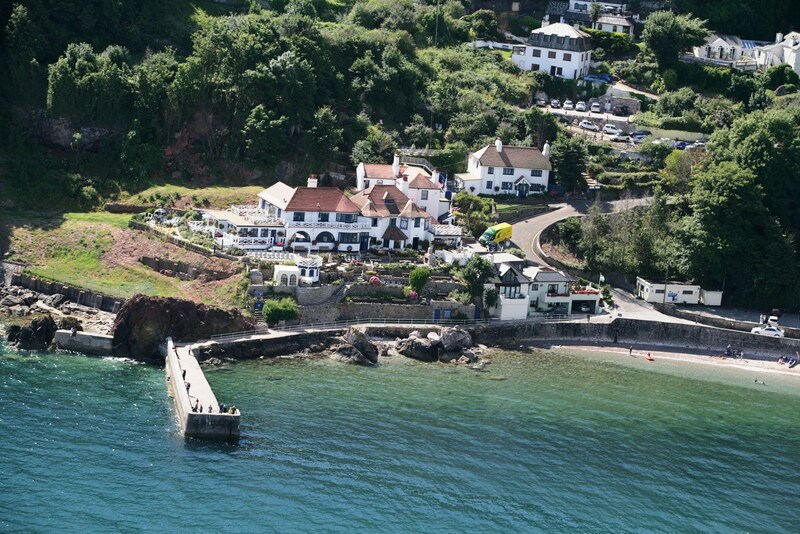 Babbacombe is famous for its funicular railway which heads from the downs to Oddicombe beach. This is a 2-minute journey, but we would recommend the steep access road that wind through the woods. 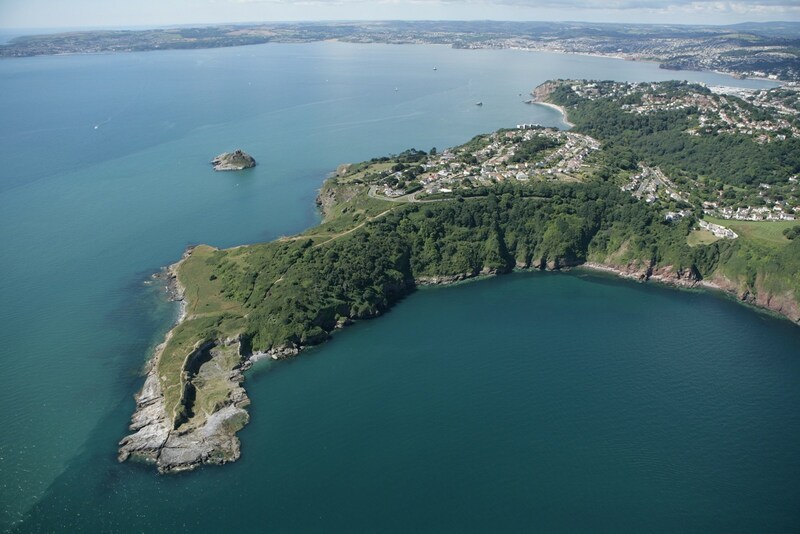 It’s fairly secluded and a great dog friendly beach in Torquay. Once at Oddicombe beach, which is large and sand/shingle, you can let your dog play in the winter months, but in the summer you will need to head right and go to the smaller Babbacombe beach but next to the Cary Arms and the small café which does great bacon sandwiches. Next head up past the Cary Arms and follow the coastal footpath up into the woods (don’t go more than 50 yards up the main road before you head left). This path will take you to the top of the headland calls Walls Hill a well-known ancient archaeological site. These rolling downs lead to the headland overlooking Lyme Bay. 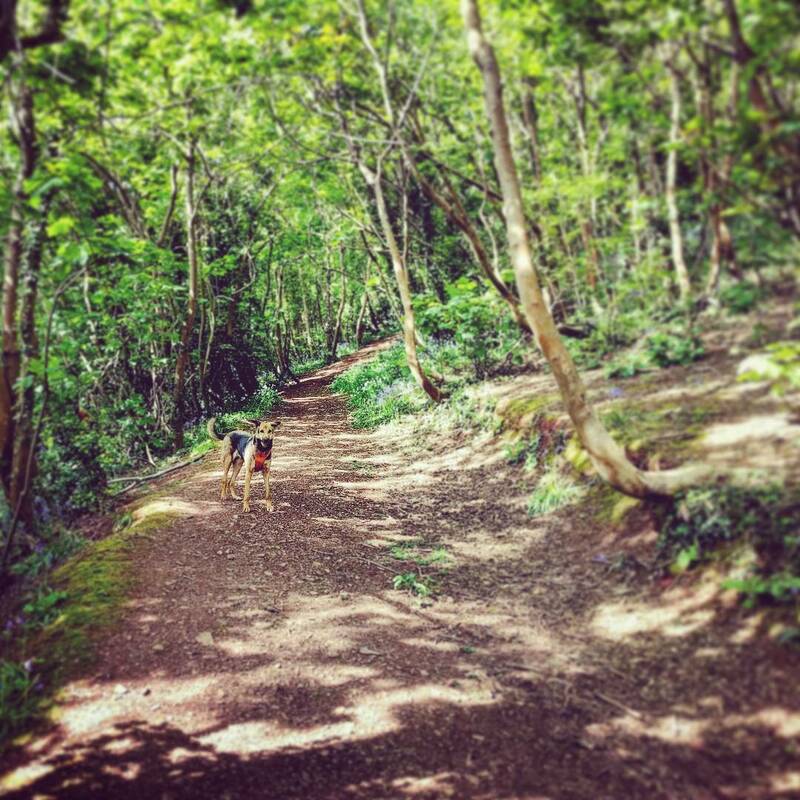 Follow the coast around and you will come into a woodland path leading down to Anstey’s cove. This is a steep walk down and has a café but limited dog opportunities. Instead continue along the coastal path (“Bishops Walk”), which leads to Ilsham road. This walk is about a mile and a half and is through woods overlooking Lyme Bay. This is great for dogs to run through the woods. There are plenty of fox and badger trails and sometimes deer too. On a good day you can see dolphins to the left and plenty of wildlife to the right! Once you hit Ilsham road, cross over and go up the hill around the corner and follow the path alongside and above the road to Hopes Nose. This is found at the end of the path and across the road and over a stile. Hope Nose is a favourite fisherman’s spot, but the best dog walking, view and experience are found by heading right once you hit the level after a bout 150 yards downhill. It’s a climb up and down but well worth it. You are then looking across Torbay to Berry Head and Brixham. Moving on from Hopes Nose and coming back up the hill, turn left after the stile and follow down the road to a green on the left overlooking Thatcher Rock. This green, park and garden lead down to Thatcher point. The coastal paths winds alongside the park and back onto the main road. From here you will need to follow the road for about ½ mile down to Meadfoot beach. The north end has lots more rocks, but a good stretch of beach and the south end more beach and a combination of sand and shingle. Depending on the state of the tide you can let your dog roam both beaches in the winter but only the North beach in the spring and summer. Beach Mews only 100 yards from the beach and Hesketh Crescent (bar and outdoor dining too). On the coastal footpath from Torquay through to Shaldon and onwards. 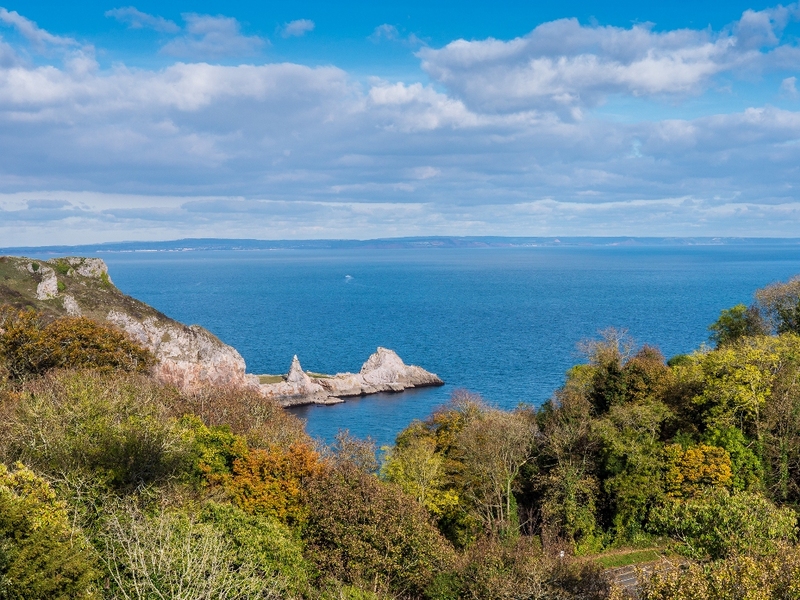 Beach Mews is situated in an inspiring and pretty locality of Torquay, just moments from the fine Regency Hesketh Crescent and the blue flagged Meadfoot Beach to this holiday home provides the perfect family-friendly retreat! You can also enjoy the labyrinth of beautiful Ilsham woodland paths that lead to open picnic grassland of Ilsham Valley. Allocated parking is conveniently provided for guests staying at this beautifully modernizedd character townhouse which provides bright and spacious accommodation with fine attention to details in its furnishings and presentation to ensure guests fully enjoy a home-from-home stay. The front door entrance leads into a charming and beautifully furnished living room. Guests can fully relax in this stylish and sumptuous room, which is furnished with a pair of comfortable cream leather sofas situated under a pretty crystal chandelier with lovely contemporary lampshades to the room to provide ambience in the evenings. A large flat screen TV with DVD player, movie library and a Play Station 2, provides guests with modern day amusement also. The pretty townhouse also benefits from a spacious fully fitted kitchen and a sunny garden view dining area complete with optional baby highchair, can easily accommodate a family or group up to 6. Guests can easily enjoy the freedom of cooking delicious home-cooked meals during their stay if they wish with a gas hob, eye level oven, fitted microwave, tall fridge-freezer and dishwasher. A charming sunny paved terrace courtyard garden provides a lovely sun trap in which to enjoy the glorious mild Torquay climate and an outdoor dining area with parasol provides the ideal spot for alfresco dining during your stay! The sleeping accommodation is situated upstairs and features 2 bedrooms comprising of a spacious master bedroom fitted with a luxury en suite shower room, a luxurious king size bed with Vi-Spring mattress and a flat screen TV. 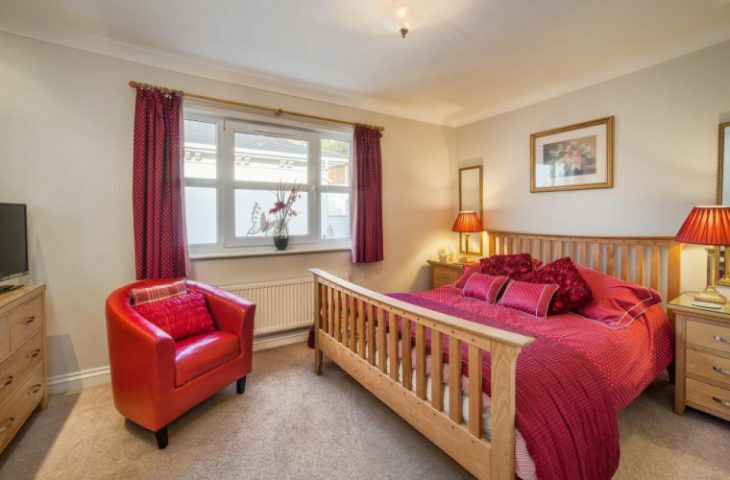 The second bedroom is fitted in a pleasing nautical style and fitted with a pair of twin beds. A baby cot is also provided in the property for guest’s convenience. Aside from the luxury en-suite to the master bedroom, a modern family bathroom is also provided and is fitted with a bath tub with shower head mixed, wash basin and WC. A cloakroom WC is conveniently situated to the ground floor of the property also. From the charming row of picturesque townhouses, guests are perfectly placed to enjoy the Lincombe Woods with its South West Coastal path to award winning Meadfoot Beach, the wide range of restaurants and Health Club situated along the fine Regency Hesketh Crescent and also the wide selection of amenities and attractions of Wellswood village and the bustling coastal resort town of Torquay with its aquatic centre ‘Living Coasts’, boat charter, dolphin trips and vibrant palm tree-lined marina and historical visitor centre.